In the time it takes to read this review, several hundred new websites will have become active. The statistics are staggering: there are over 100 million domains (such as google.com) in existence today. Staying on top of your favorite web sites and finding useful new sites can be a formidable task. One method for saving your favorite web sites is to utilize the bookmarking feature within your web browser (Internet Explorer, Firefox, Safari, etc.) but if you’re like most of us, many saved bookmarks never see the light of day. Bookmarks saved within your browser are difficult to search and are only accessible on one computer. Del.icio.us enables you to save your bookmarks on the web, retrieve from any computer and share your findings with the world. 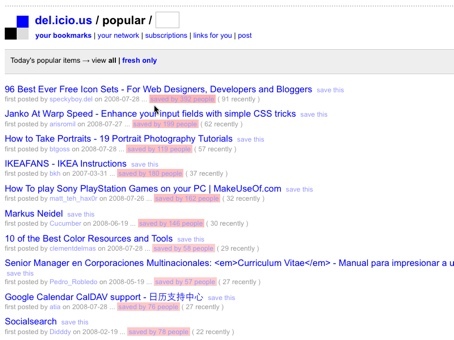 All bookmarks on Del.icio.us can be searched by entering keywords or clicking on specific “tags”. Tags make it easy to organize your bookmarks into categories such as “carstuff”, “interesting”, “travel”, “freebie”, etc. While the design of Del.icio.us is understated, the real beauty of the application is found in its simple accessibility.